Through the first 12 games, the Bishop Carroll Golden Eagles defense has played as well if not better than any team in the school’s storied history. However, none of that will matter if the Eagles are unable to bring home a state championship. 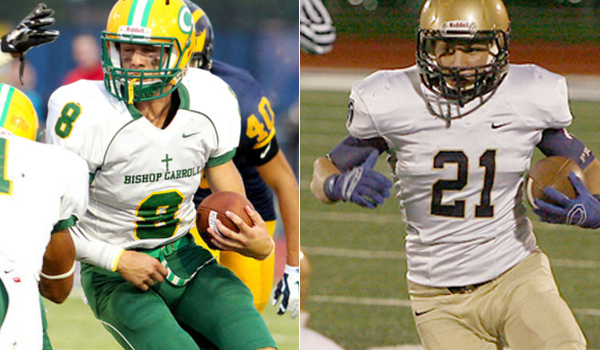 Bishop Carroll (12-0) and St. Thomas Aquinas (9-3) face off in the Class 5A state championship at 1 p.m. Saturday at Pittsburg State University’s Carnie Smith Stadium. The Eagles enter the game having allowed only 58 points all season. None of those points have been yielded against Carroll’s first-team defense. Carroll has registered six shutouts this season and is coming off a 49-0 semifinal win over a Salina South team that scored more than 30 points in seven of its 11 previous games. Senior Samuel Honas is among Carroll’s defensive leaders with nine sacks. Mark Quaney leads the team with four interceptions. “They have a program,” St. Thomas Aquinas coach Randy Dreiling said. “They’re extremely well coached. They build their players from the bottom up, and they have a lot of kids out for football. It’s very similar to what we had at Hutch. You have kids who put their time in and when they’re seniors, they want to be successful. They want their time on the field. Offensively, the Eagles are led by senior running back Denzel Goolsby, who has rushed for 1,508 yards and 30 touchdowns. Senior quarterback Colton Howell has passed for almost 1,400 yards while rushing for more than 700. Dreiling, who helped build Hutchinson into a state powerhouse, is in his first season as head coach at Aquinas. In one season, he has taken the Saints from a 3-7 record to a team that is one win away from a state title. The Saints are in this position despite suffering a rash of injuries throughout the season. Leading rusher James Consentino broke his leg in a Week 9 loss to Pittsburg. Aquinas also has lost its right guard, center, linebacker, cornerback, backup running back and slotback for the season. “We’re not using those as excuses,” Dreiling said. “They’re not excuses. We’re still winning. They’re only excuses if you lose. It’s given a heck of an opportunity for these other guys who we never thought would be starting are all of a sudden starting and playing in playoff games and will be playing in a state championship game. The Saints’ flexbone offense is rushing for about 340 yards per game. St. Thomas Aquinas quarterback Karter Oderman rushed for four touchdowns during the Saints’ 42-41 win over Shawnee Heights last week.